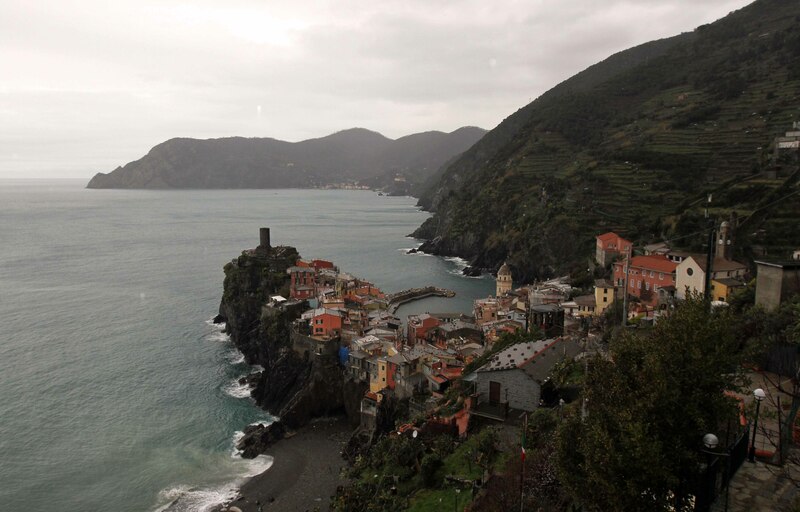 I visited Cinque Terre (staying in an apartment in Vernazza) from 5-8 April in 2013 to enjoy the Italian Riviera (after having just visited the snow covered Swiss Alps; unfortunately it was too wet and cold to correctly enjoy the riviera; however, I still had a great time – with the help of copious amounts of wine), before continuing on to Pisa; what follows are some of the photographs I took while I was in Cinque Terre. 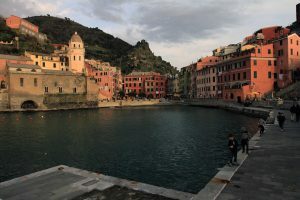 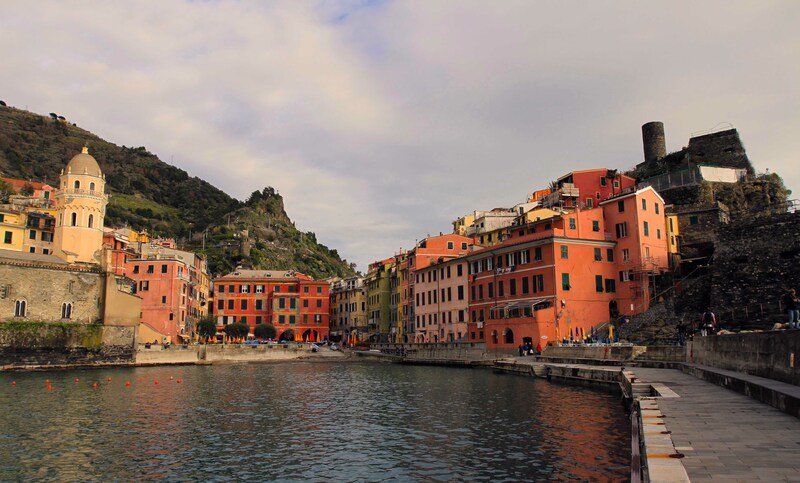 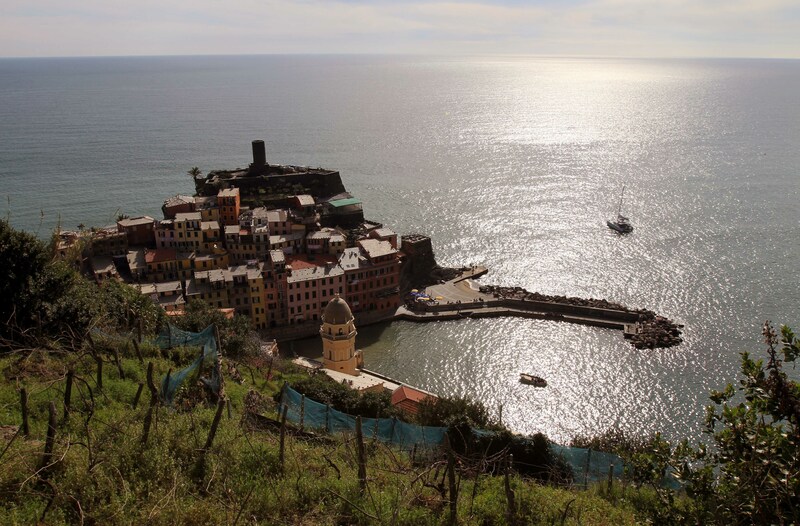 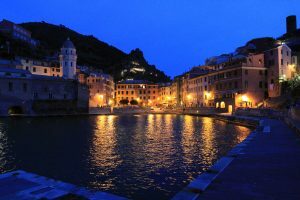 Vernazza, one of the five towns that make up the Cinque Terre region on the Italian Riviera. 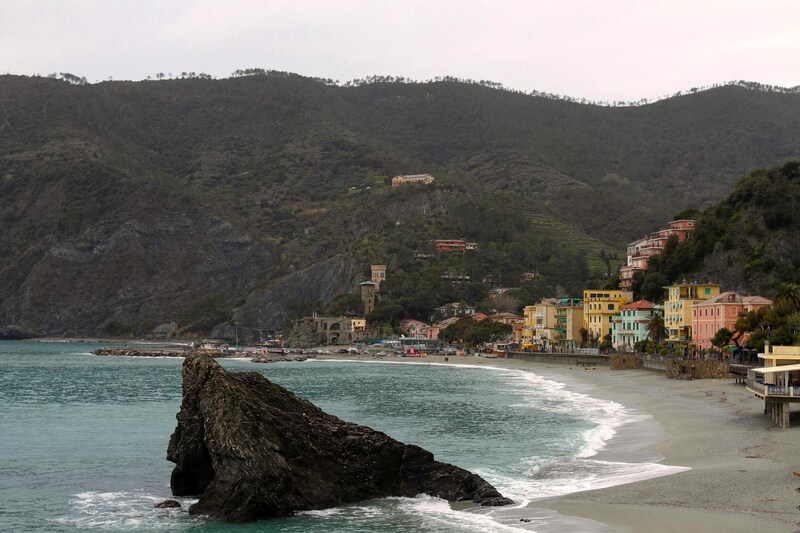 The beach at Monterosso al Mare (one of the other five towns that make up Cinque Terre). 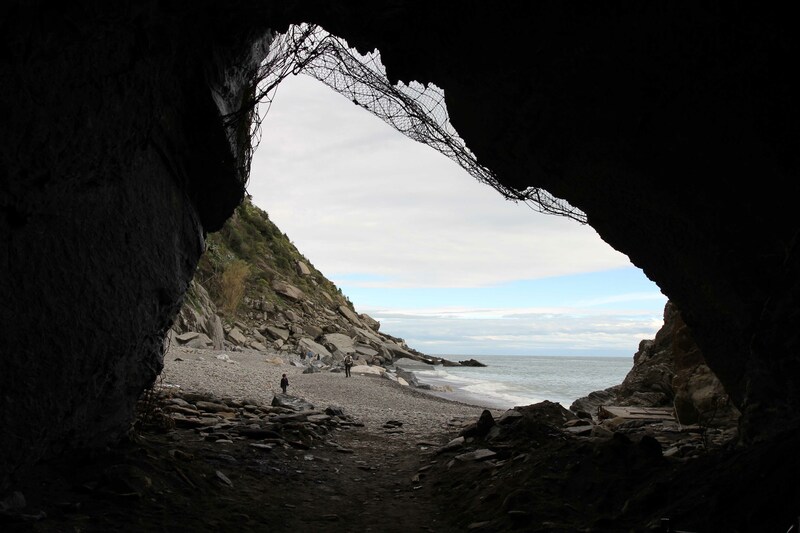 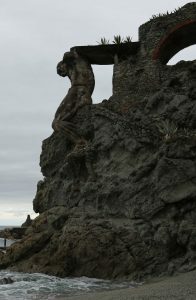 Closeup of the Monterosso Giant carved into the rock. Another view of the beach at Monterosso al Mare. 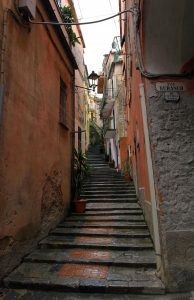 Street in Monterosso al Mare. 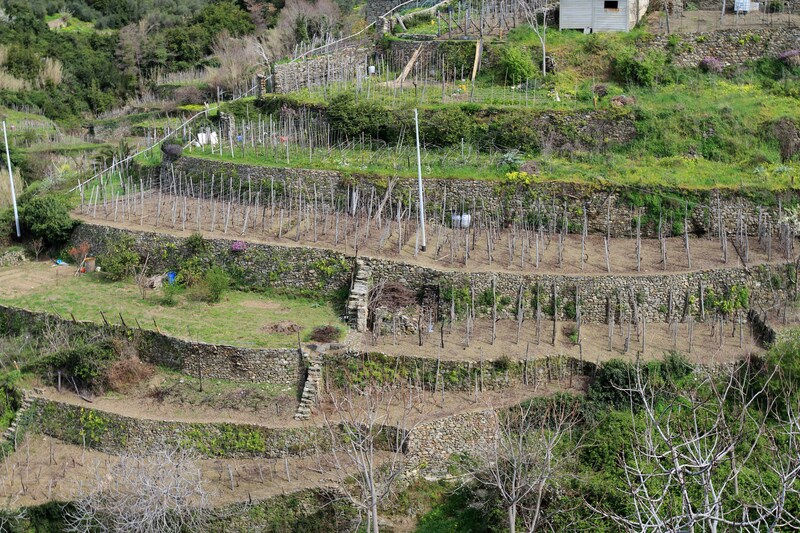 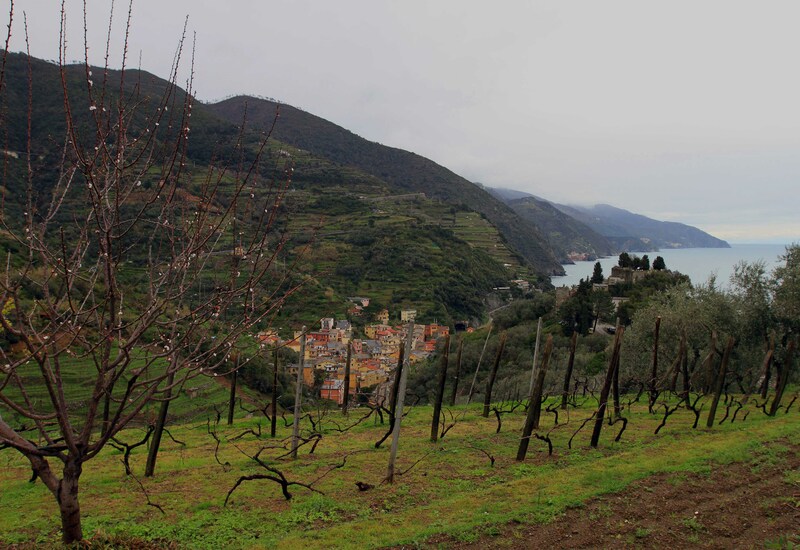 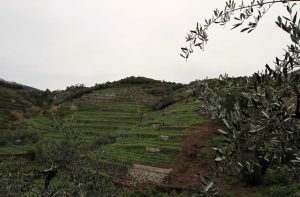 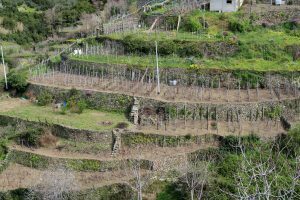 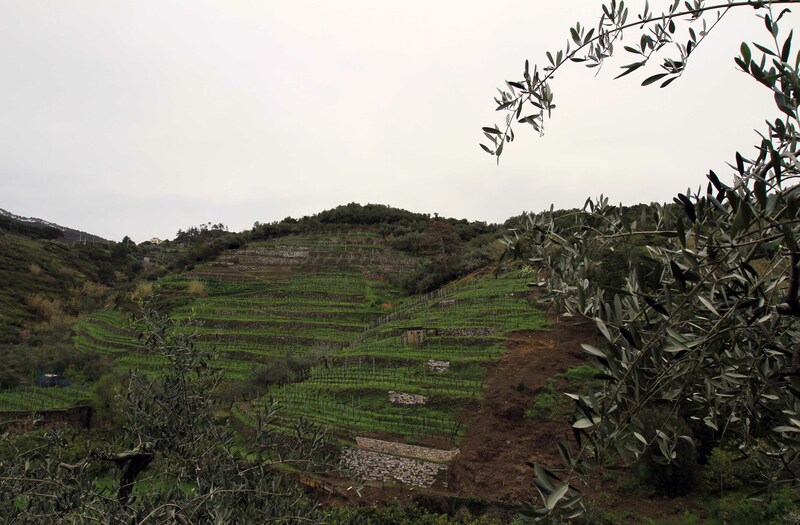 Terraced vineyards on the mountainside above Monterosso al Mare. 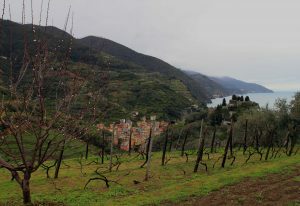 Looking down on the east part of Monterosso al Mare from a terraced vineyard. 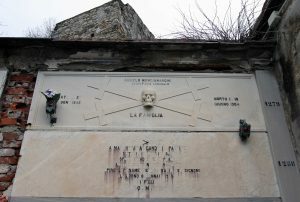 Tomb with its writing being washed away, found in the cemetery at Monterosso al Mare. 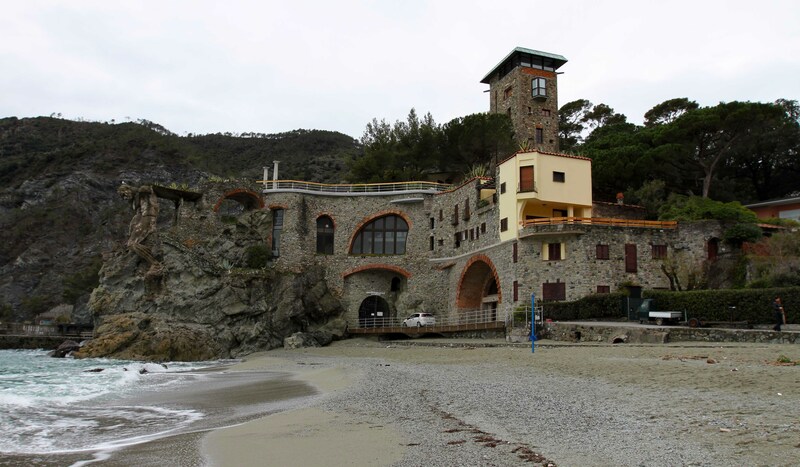 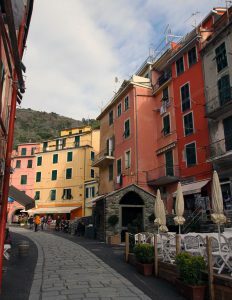 Another view of the east part of Monterosso al Mare. 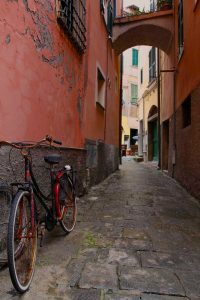 Bike parked in a street in Monterosso al Mare. 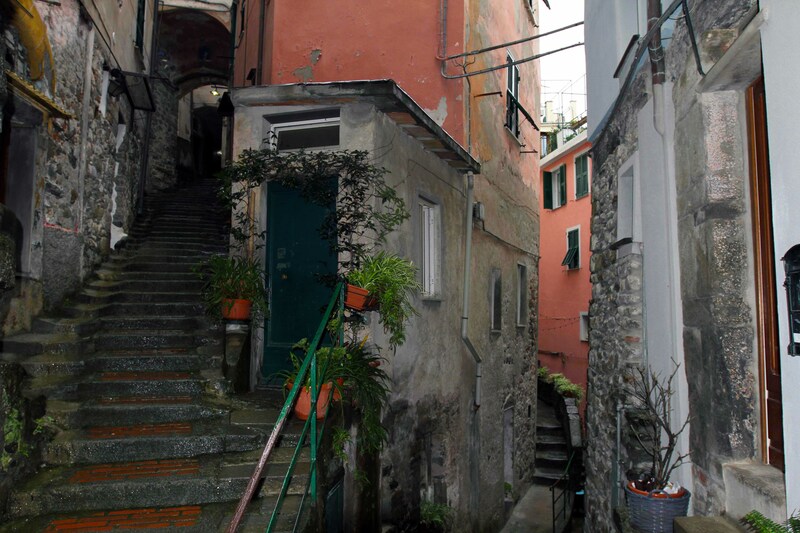 Stepped street in Monterosso al Mare. 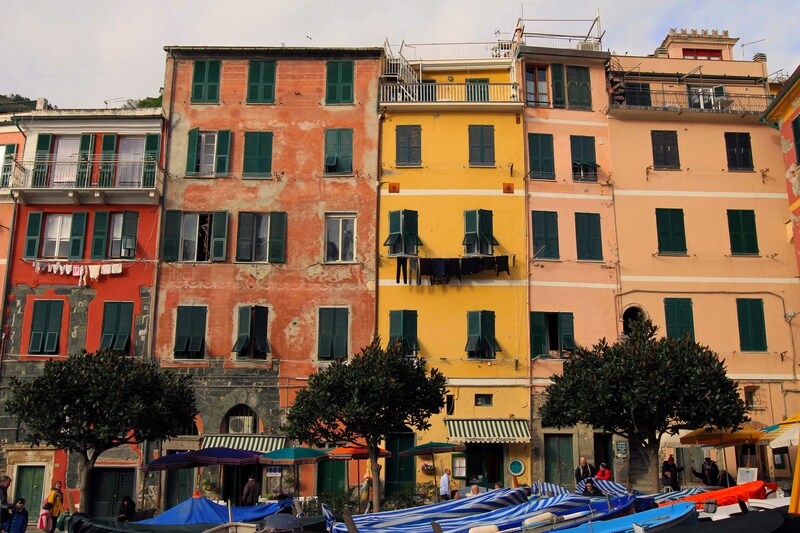 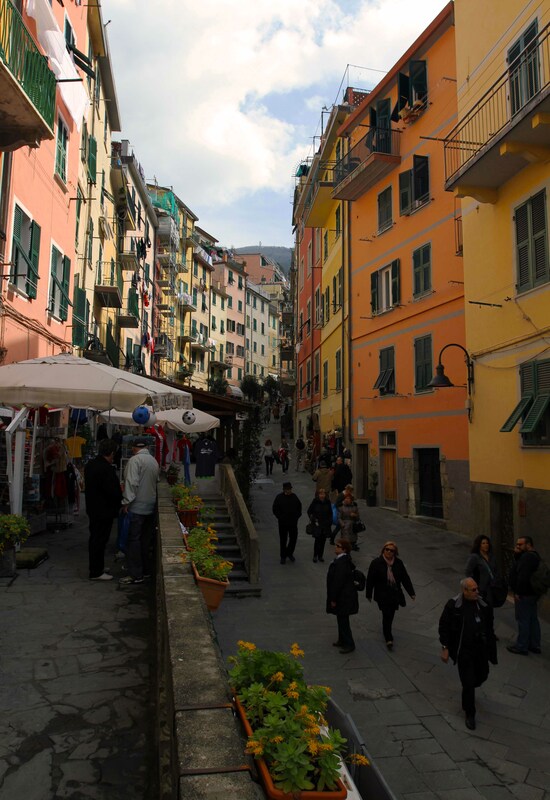 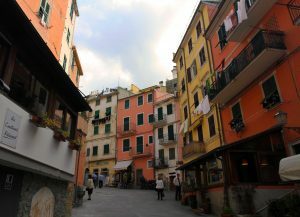 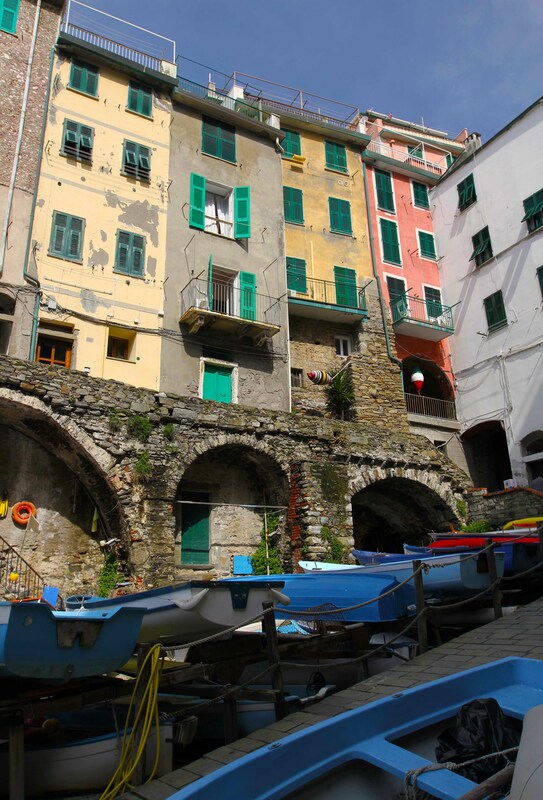 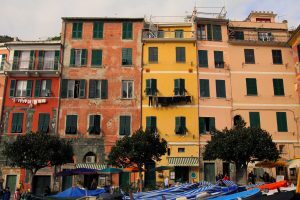 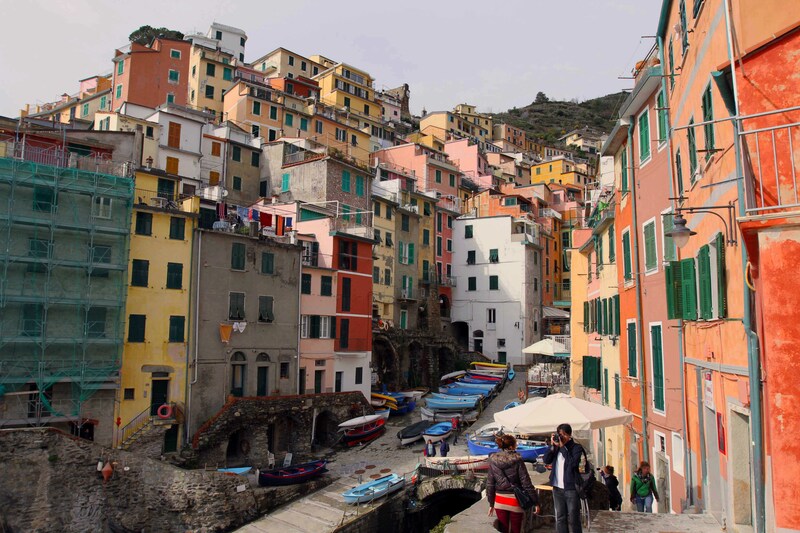 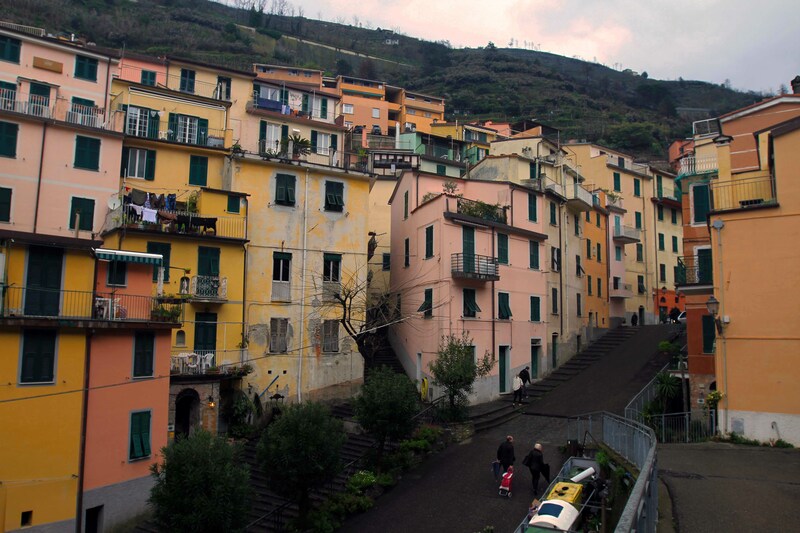 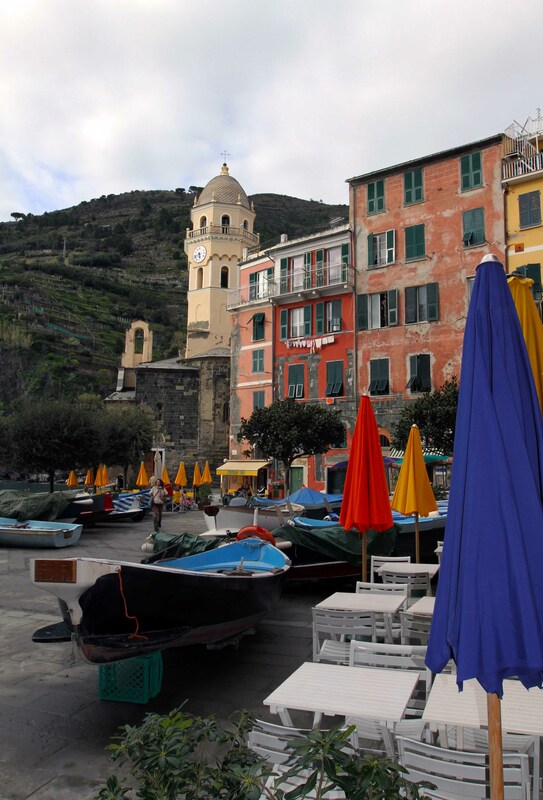 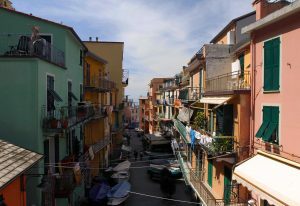 Colorful buildings in Monterosso al Mare. 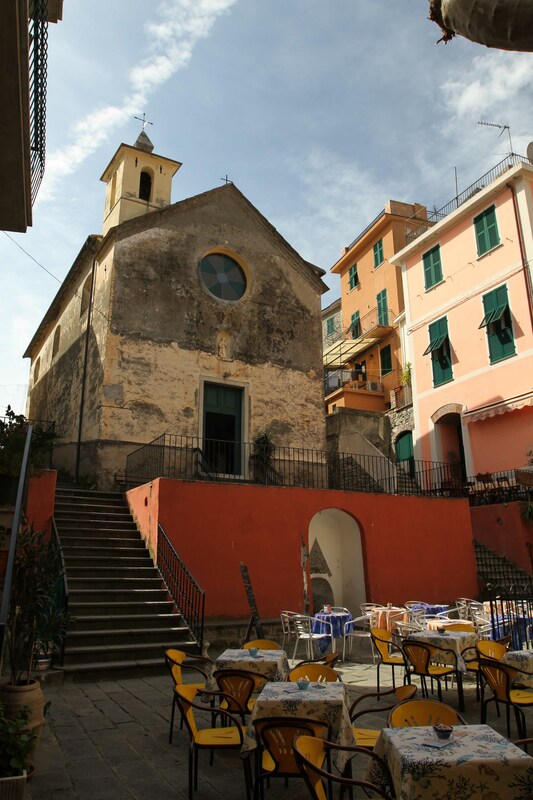 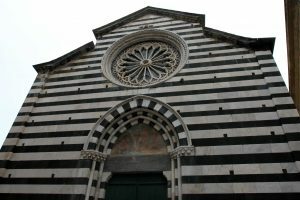 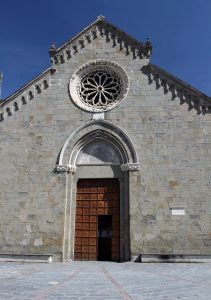 Church of Saint John Baptist in Monterosso al Mare. 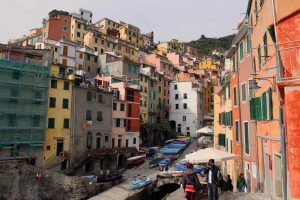 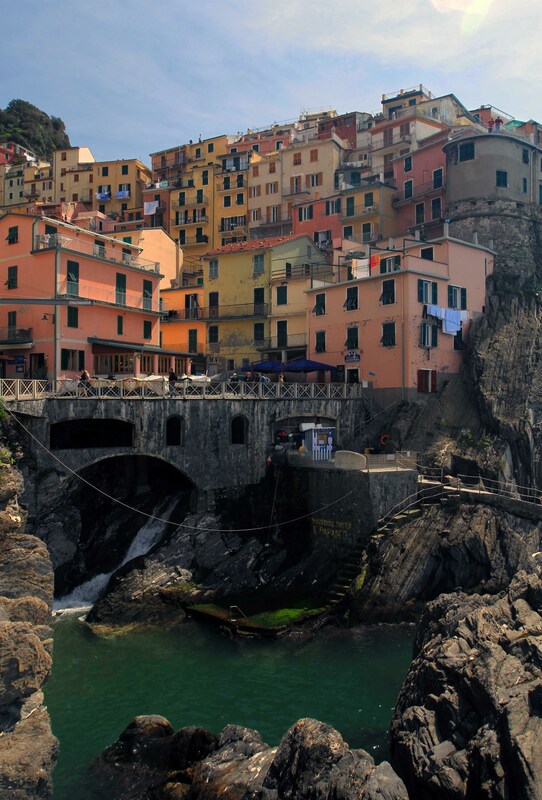 Riomaggiore (another one of the five towns that make up Cinque Terre). Entrance to the beach (through this natural tunnel) south of Riomaggiore. 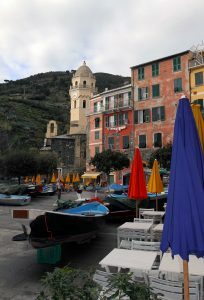 Boats propped up in Vernazza with the bell tower of Santa Margherita di Antiochia Church visible. 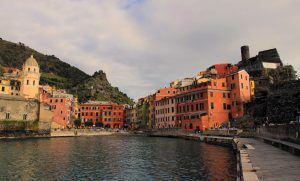 Vernazza seen from the quay. 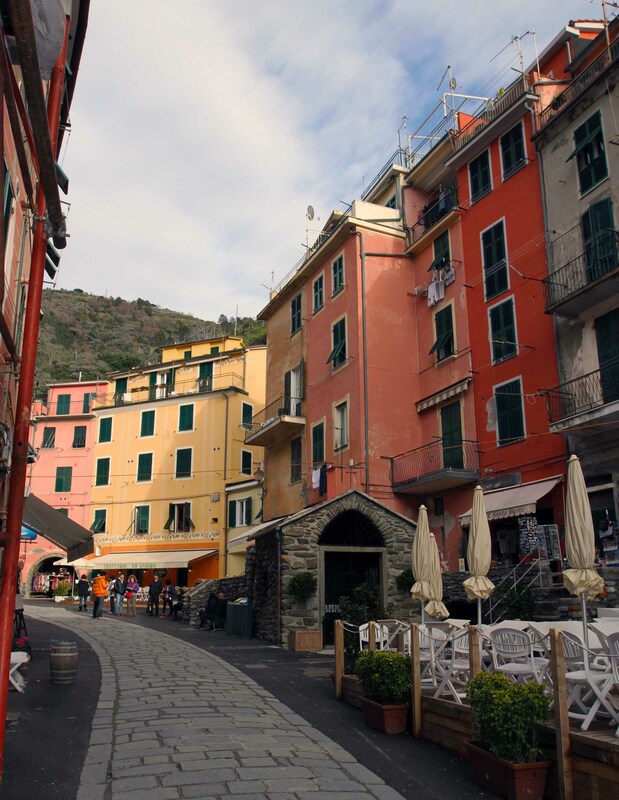 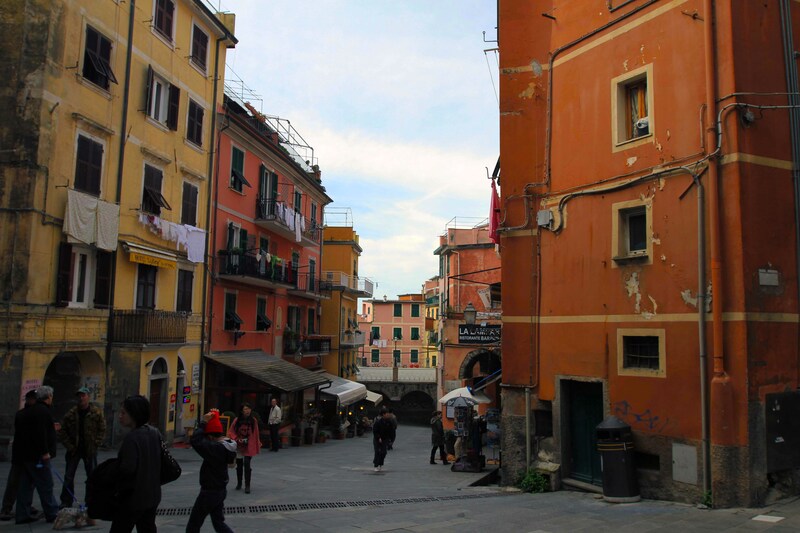 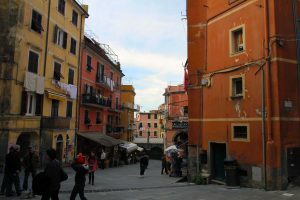 Walking down Via Roma in Vernazza. 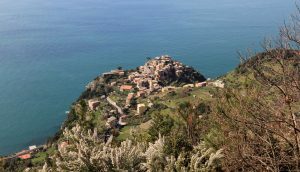 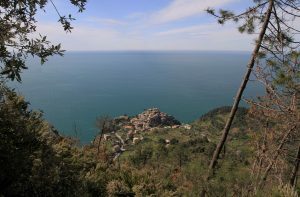 Corniglia (one of the other five towns that make up Cinque Terre), seen in the distance from the trail between Vernazza and Corniglia. 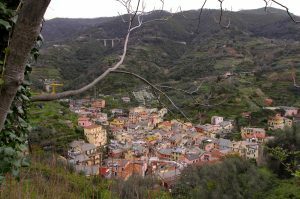 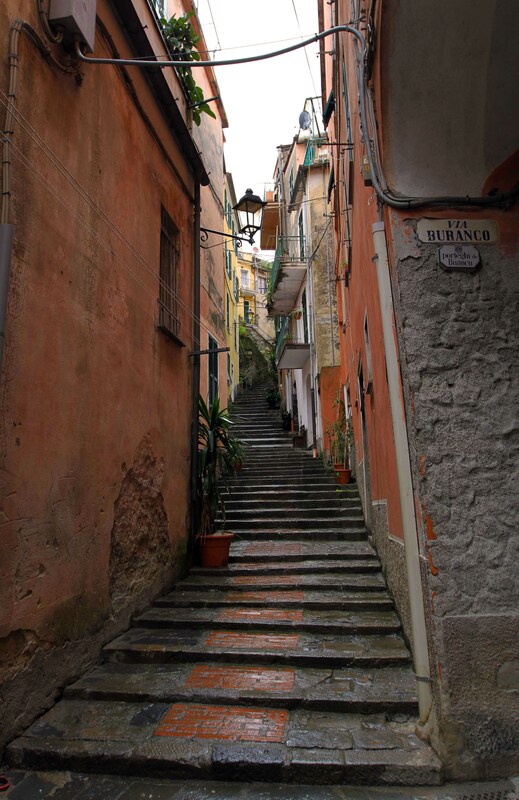 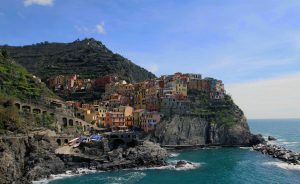 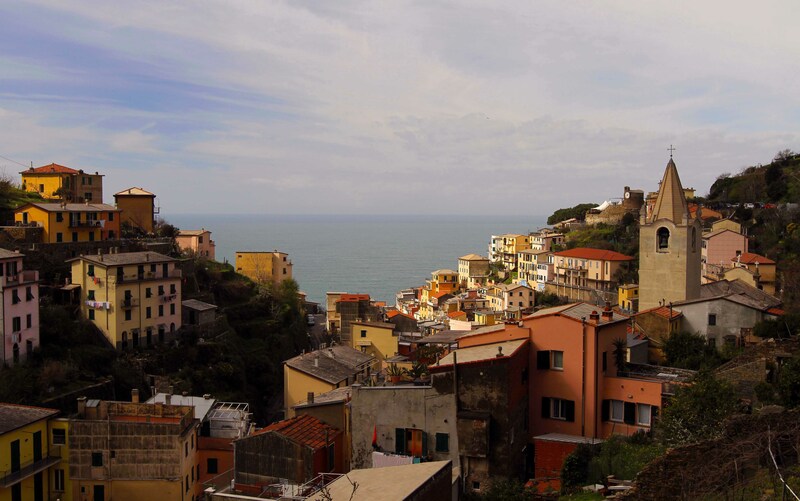 Closer view of Corniglia – unlike the other four towns in Cinque Terre, Corniglia is not directly adjacent to the sea and sits 100 meters high. 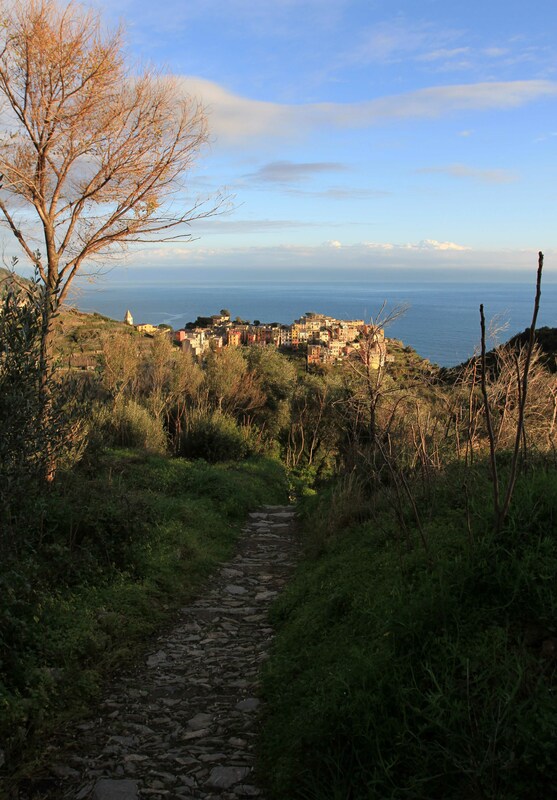 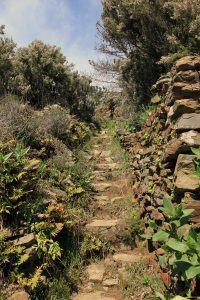 The stone path leading to Corniglia. 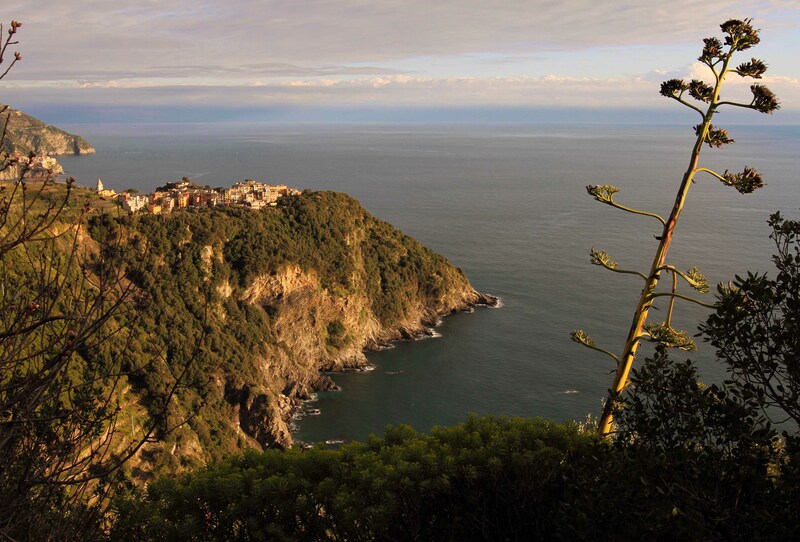 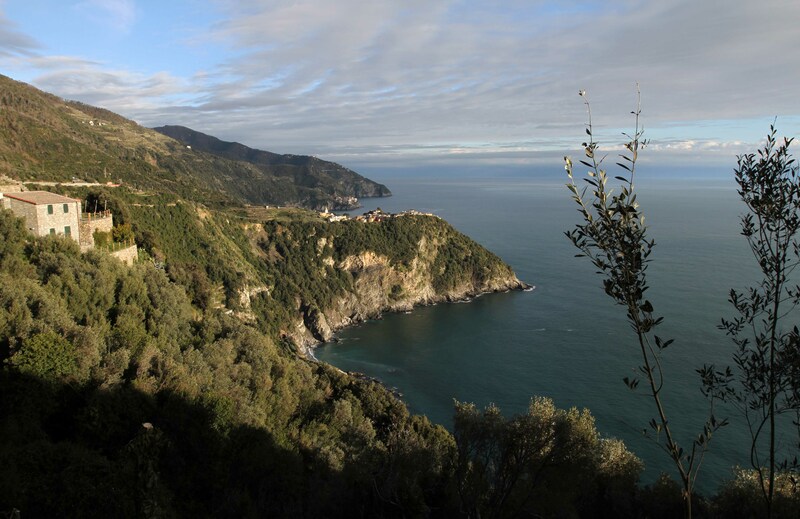 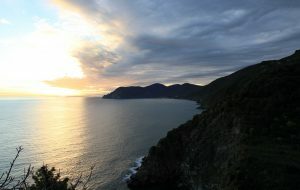 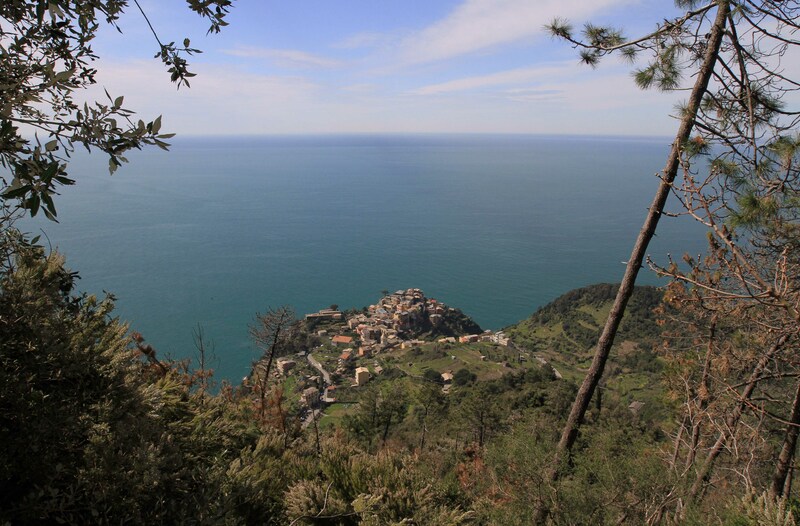 Looking north, toward Monterosso al Mare (seen in the far distance), from Corniglia. 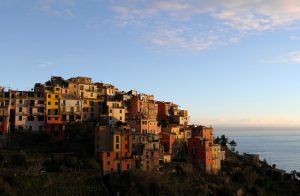 Manarola (the last of the five towns that make up Cinque Terre – that is, the “last” one that I saw on my first day in Cinque Terre) in the distance, seen from Corniglia. 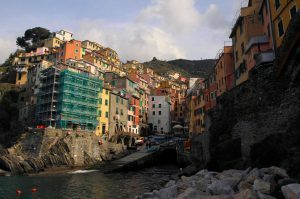 Riomaggiore, seen from the rocks by the sea. 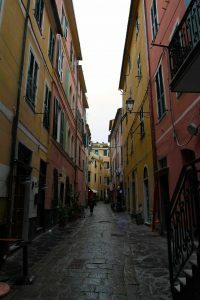 Via Colombo, looking the opposite way, toward the sea. 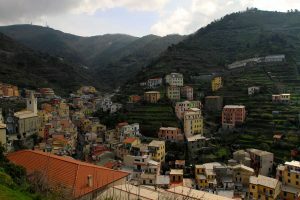 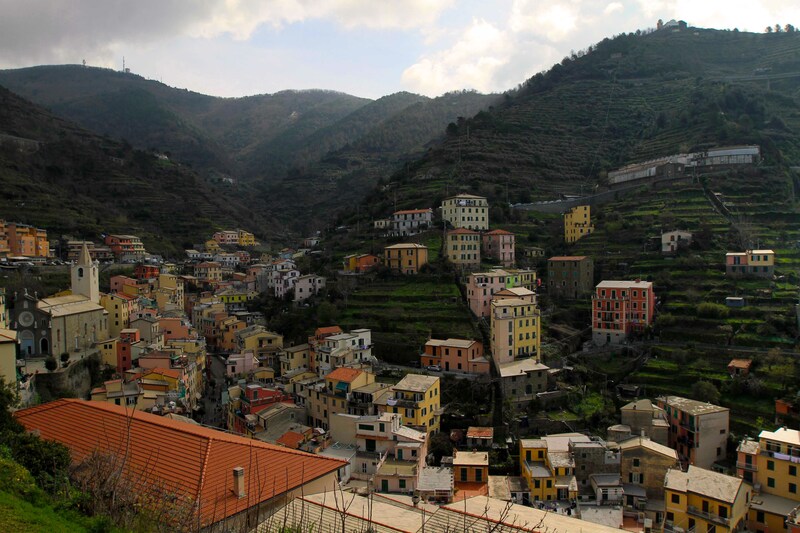 Riomaggiore and the surrounding mountains. 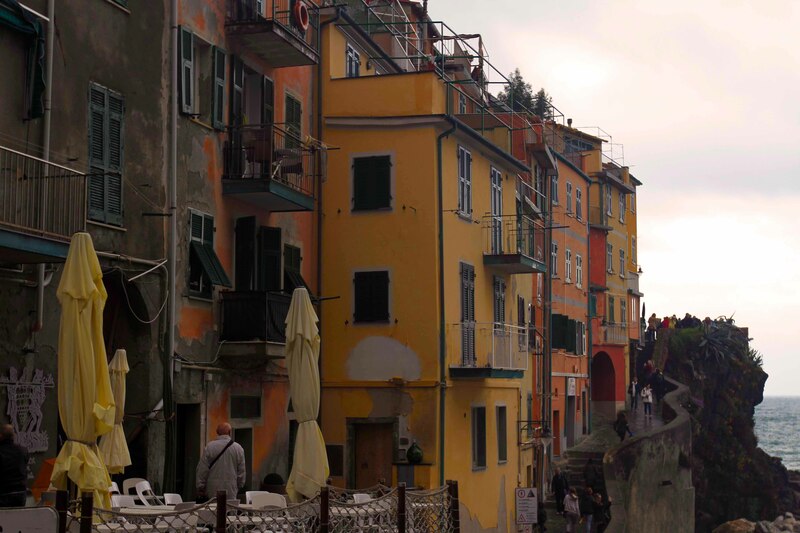 Boats lined up along the ramp next to the sea in Riomaggiore. Another view of Via Colombo in Riomaggiore. 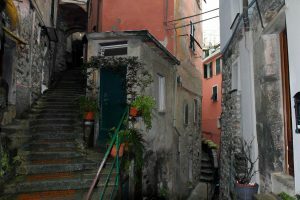 Via Renato Birolli in Manarola. 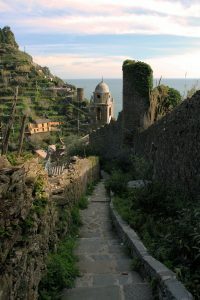 View of Manarola and the steps leading to the sea. Corniglia and Monterosso al Mare (just barely visible), seen from Manarola. 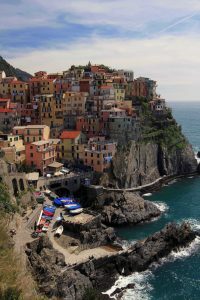 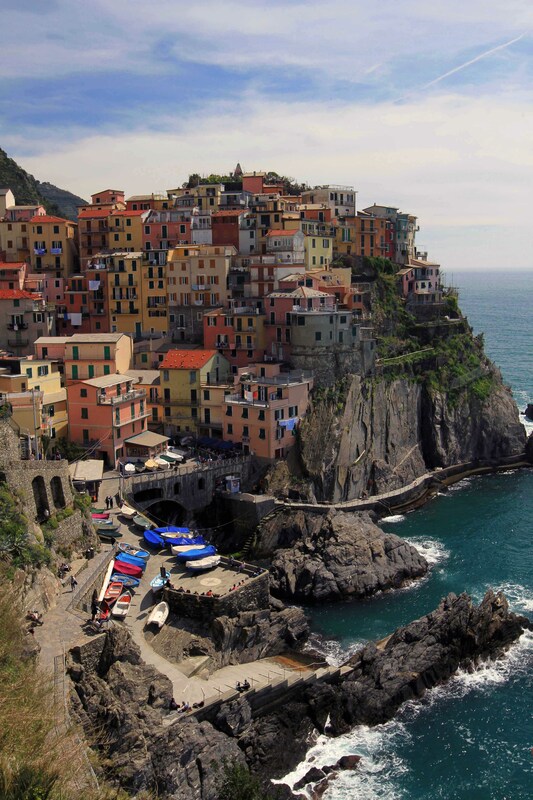 A nice view of Manarola. 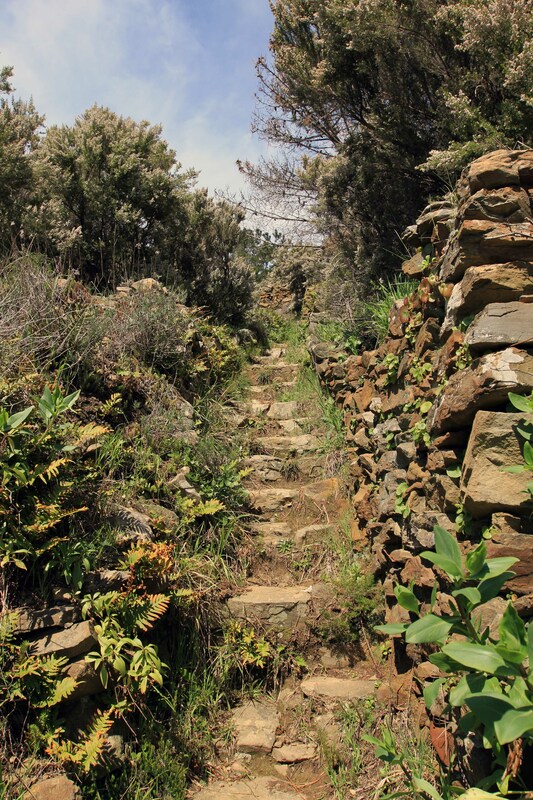 Rock-stepped trail leading up the mountainside above Manarola. 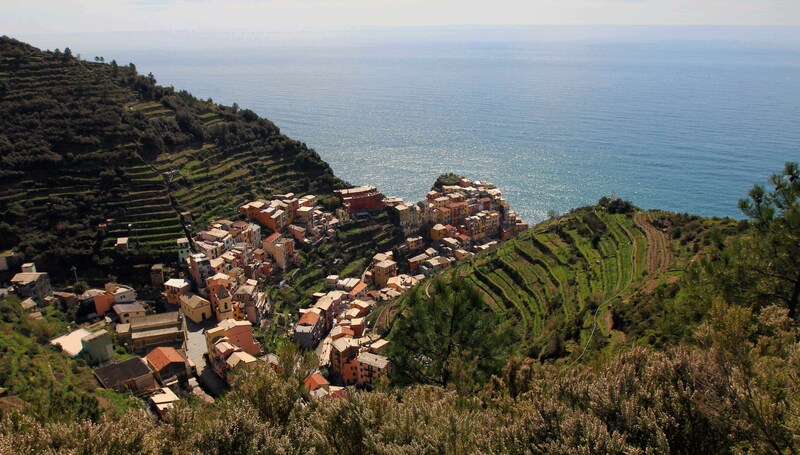 Manarola, terraced vineyards, and the Ligurian Sea. Church of San Lorenzo in Manarola. 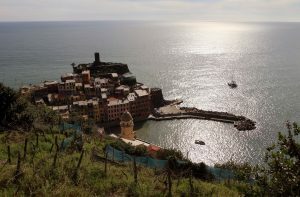 Vernazza, seen from the mountainside. 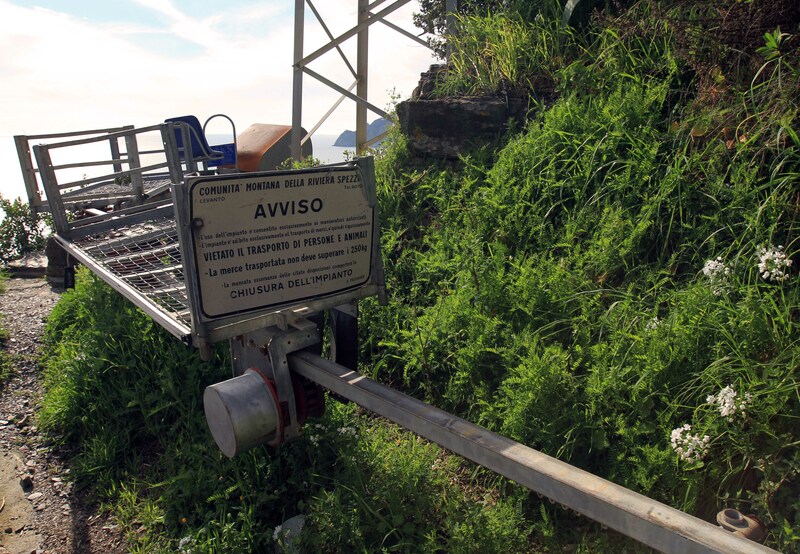 A miniature monorail used to transport harvested grapes in the terraced vineyards. 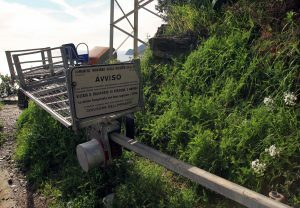 The stepped path back down to Vernazza. 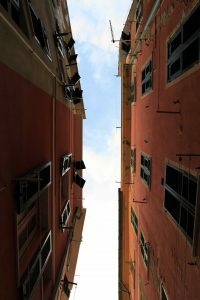 Looking up from a street at the gap between buildings in Vernazza. 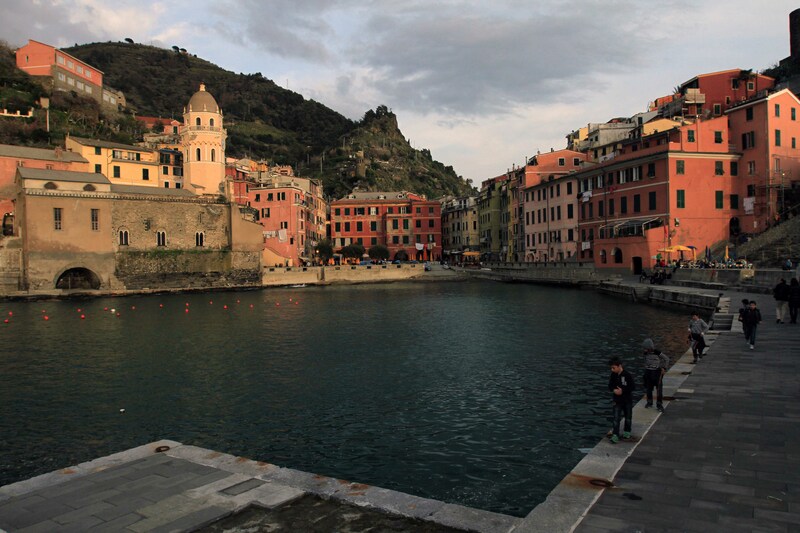 Children walking along the quay in Vernazza. 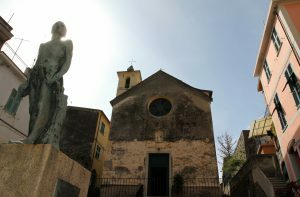 Statue in front of the Oratory of St. Catherine in Corniglia. Inside the Oratory of St. Catherine. 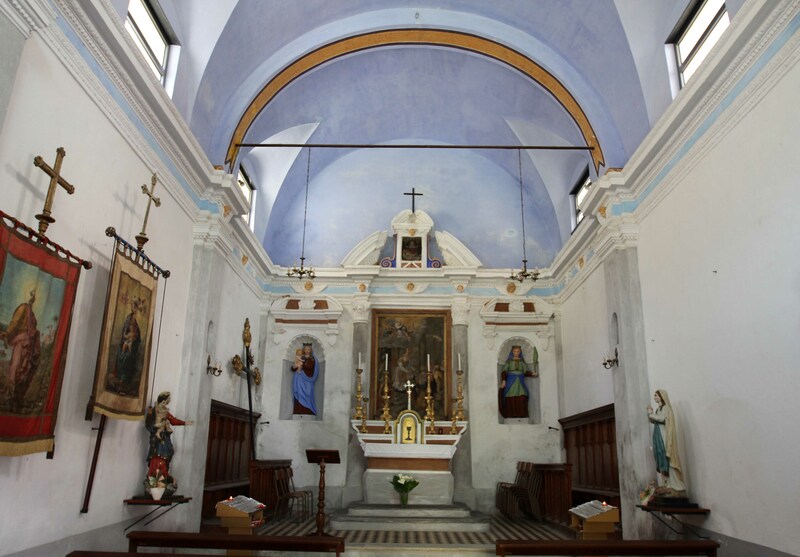 Another view of the Oratory of St. Catherine. 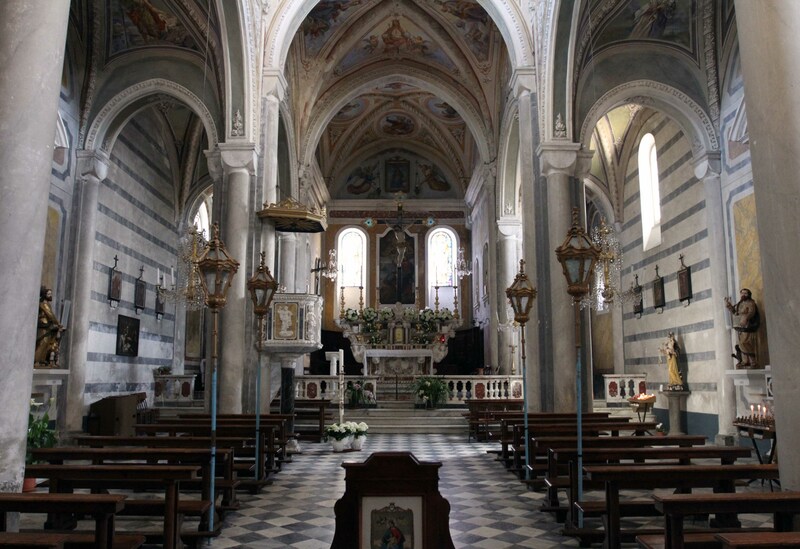 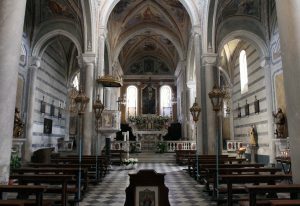 The interior of St. Peter’s Church in Corniglia. 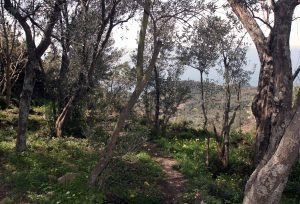 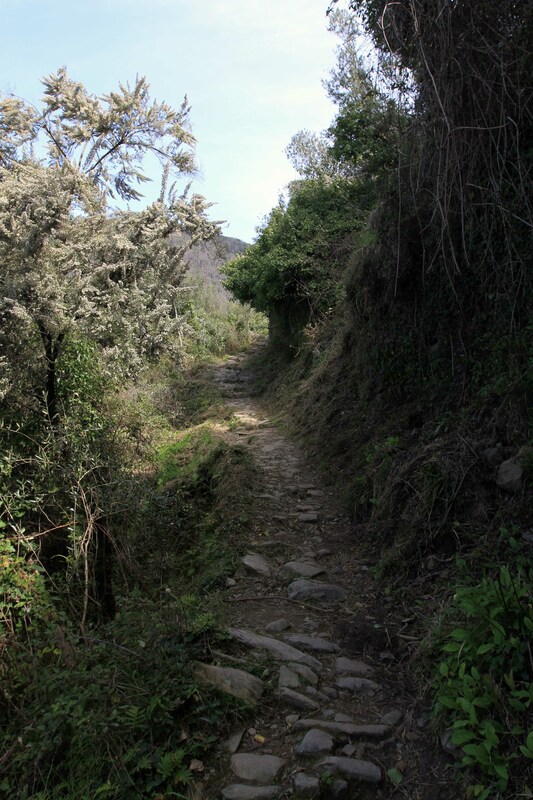 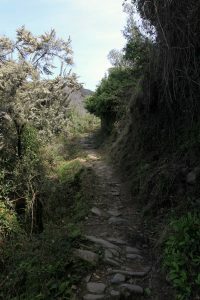 Path leading up the mountainside from Corniglia. Corniglia seen from the mountainside. Idyllic path through olive trees. Cross covered in objects from the Passion. 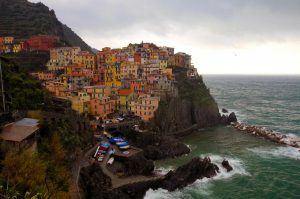 Manarola on a rainy day. 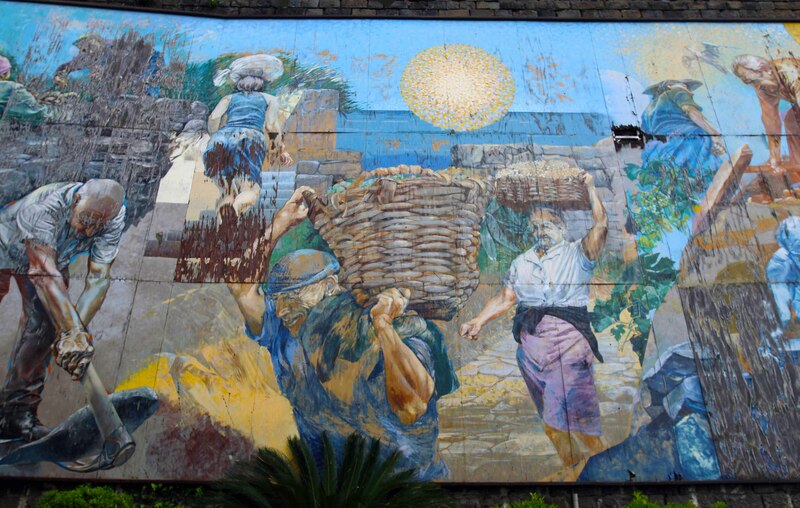 Wall painting next to the Riomaggiore train station that depicts the labor that went into building the terraced vineyards in Cinque Terre, as well as the work carried out during harvest. 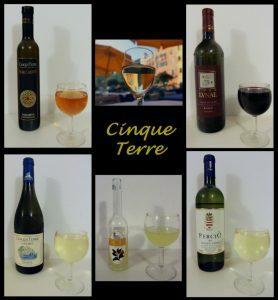 Some of the wine I enjoyed while staying in Cinque Terre.